For all the negativity going around this is actually a pretty amazing cultural moment. From Glee to the cover of ELLE with Gabourey Sidibe there has never been a time in our pop culture history when beauty and talent were acknowledged and celebrated in every form, shape, size, color and breed. I love this cover, it’s beautiful in countless ways. Happy Birthday ELLE! Also LOVE the Quarterbacks feature, the whole issue looks amazing but what else is new. 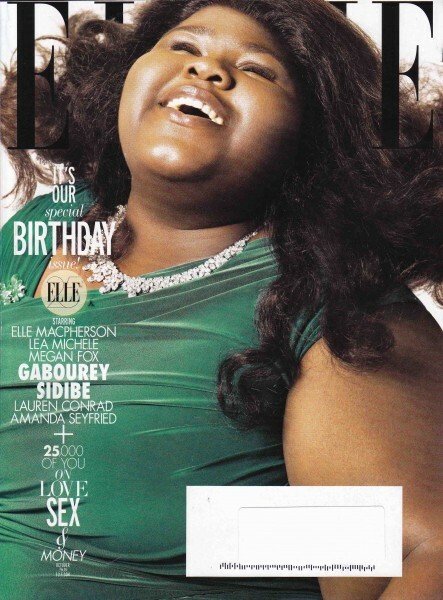 This entry was posted in Uncategorized and tagged ELLE 25th Anniversary Issue, ELLE Magazine, Gabourey Sidibe, Glee. Bookmark the permalink.